Today the University of Washington Huskies play Arizona State at Husky Stadium. The Huskies are 9-1 over all and 6-1 in conference after their loss last week to USC. The Huskies' only hopes to get back into the national playoff picture is to be the Pac-12 Champions. But to do that they have to be the Pac-12 North Division Leader. 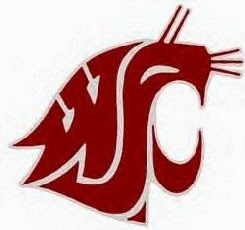 Right now the Washington State Cougars are the North Division Leader with a record of 8-2 and 7-0 in conference (your in-conference record trumps your overall record). The Cougars play Colorado in Colorado today. The Colorado Buffaloes are currently the Pac-12 South Leader with an 8-2 overall and 6-1 in-conference record. USC is right behind them (thanks to their win over the Huskies). I can imagine that's going to be a tough game for the Cougars. There are four scenarios that could happen today. the Apple Cup (the annual rivalry game between UW and WSU), which will be played on November 25th at 12:30 PM on Fox, will determine who is the Pac-12 North Leader. In #4, it doesn't matter, the Cougars will be the Pac-12 North Leader no matter who wins the Apple Cup, and go on to play in the Pac-12 Championship game December 2nd against the South Leader, who could be Colorado, USC, or perhaps even Utah. I don't think Stanford (7-3 overall, 5-3 in conference) has a chance to be the Pac-12 North Leader even in the case of #4. So there is a 3/4ths chance that the Pac-12 North Leader comes down to the Apple Cup. But I think the Huskies will beat ASU, which means the Apple Cup is for all the marbles. The Huskies' game is at 4:30 PM PST on Fox. The Cougars' game is at 12:30 PM PST, also on Fox.